These three lines is the basic narrative of Christianity. It took thousands of years to realize and it takes a lifetime to put into practice. The following is not a detailed explanation of the nature of Jesus Christ…that will come later; this is a simple look into why if you miss the fact that God is Jesus (or a better way to put it, that Jesus is God) then you miss out on why Jesus (and only Jesus) is important. From the above we can easily see that Jesus is indeed a special person, and He is a unique person. The Bible (Which, FYI, you should have access to when you are reading my articles!) describes Him as the Holy Lamb that was killed. Because of that sacrifice He has achieved blessing and honor, glory and power and is described as the only wise king. There are some people out there that want to claim Jesus but reject what the Bible says about Him. Revelation 5 is perhaps one of the most graphic images the Bible paints about the worth of Christ. The book of Revelation tells us more about Heaven than any other place in Scripture. It describes an immense scene…millions upon millions of galactic beings and every intelligent mammal on Earth are intensely curious about who is able to unlock the book/scroll. The throne is surrounded by a sea of glass, everywhere there is worship, singing and praise. God himself was there sitting on the throne. John saw the throne-room of the most powerful being in the universe. In verse 1 a scroll was in the hand of God. Scrolls were made of papyrus Scrolls could be up to 30ft long. For official documents, wax was dropped along the seams which was the way the paper was sealed and protected. The scene is so intense for the search and it becomes obvious that no one can open it. Whatever is inside of the book is of obvious importance, and the fruitless efforts by the authorities of heaven to look inside of it causes much sadness in heaven, and causes John to cry. 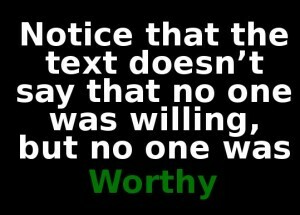 Notice that the text doesn’t say that no one was willing, but no one was worthy. The Fact that no one was worthy enough to open the scroll made John cry. 6 Then I saw a Lamb, looking as if it had been slain, standing at the center of the throne, encircled by the four living creatures and the elders. The Lamb had seven horns and seven eyes, which are the seven spirits of God sent out into all the earth. 7 He went and took the scroll from the right hand of him who sat on the throne.8 And when he had taken it, the four living creatures and the twenty-four elders fell down before the Lamb. Each one had a harp and they were holding golden bowls full of incense, which are the prayers of God’s people. There is much to take in here. Lets break it down together. John says the Lamb has seven horns and eyes. Combine this from what you know from prophecy. After all, John is writing with prophetic symbols in mind. The horn is a symbol for power (Daniel 8:22) .Seven is God’s perfect number. Thus Seven Horns indicates Perfect Power (or all powerful omnipotence). Likewise, Seven eyes points to perfect Knowledge and Wisdom (or all knowing omniscience), the symbols of God’s presence is His Spirit which means that He is ever-present throughout the earth (omnipresent). These described qualities are none other than the attributes of than God Himself. Belongs in a cage. Belongs in a petting zoo. Is a great hunter Is hunted. No wonder His praise and glory shall not fail throughout eternity (the paradoxes are numerous . Look at the Song they sing about the Lamb. What is it that makes the lamb so worthy? It is His death and Resurrection that makes him worthy (Revelation 5:8-14) Every creature in heaven worships the Lamb. It is His death (Revelation 5:9) that makes Him worthy. In verse 12 the focus of their worship is on the fact that the lamb was slain. 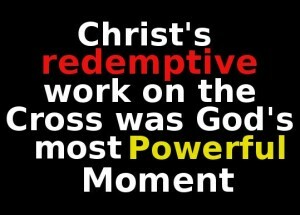 His is worthy due to His victory of the cross. The Cross is at the center of it all in heaven. It is Christ who is able to take the scroll, whom they are shouting about, whom they are singing about, it is him who is worthy. It is not enough to say that Jesus is simply a good person. Or that He was a prophet. it is not even enough to say that Jesus was God’s first work. Revelation 5 alone must motivate you to say “I believe that Jesus is God”. The entire Bible is testifying about Jesus. The Angels and Elders and Living Creatures in Heaven are all talking about Him. He is the center of attention, and what He did at the Cross for sinners is the prime subject. The song by Chris Tomlin has the line “We Believe our God is Jesus” Which is a great song, but incomplete. God is interconnected with the Father, Spirit and Son: They are One. This article does not touch the trinity, but Revelation 5 has revealed to us one part of that puzzle, that Jesus is God. What do you think about Jesus Christ in Revelation 5, Is He that Worthy? Comment Below!